In Barefoot Ceramics now you can paint your own Daleks from the popular BBC TV series. 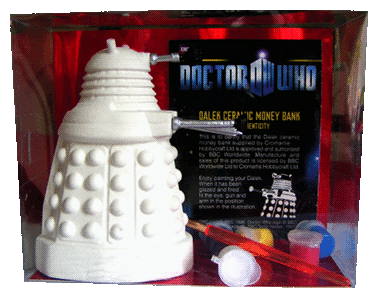 These are official Dalek moneybanks with a certificate of authentication. They stand about 14cm/6½ins tall and are 10cm wide at the base. More information coming here soon. Please email, contact via the web or facebook or call us at the studio if you need details; contact information here.